I love jewelry and Avery loves my Jewelry, But she's never had any of her own. Until Snazzy Stuff offered each of us a piece. A gorgeous piece at that! I received the BEAUTIFUL Aqua and Amethyst Collage Necklace and Avery received a beautiful Custom Bracelet! Avery couldn't wait to get her bracelet. These items came right in between our birthdays so it was a late birthday gift for Avery and an early gift for myself. It was kind of nice! Hard to see Avery's, but it's pink, purple and green, her favorite colors. She loves it. It sits on our kitchen counter and she puts it on almost every day. I love my necklace, it can match almost anything. You see it up there with a brown tank and I was wearing white capris. It gave some color to my outfit. It looks great with a blue or purple top too. Blue is my favorite clothing color so this matches most of my stuff perfectly. I wear it often. I have gotten a LOT of compliments on it so far and I think it's beautiful. Snazzy Stuff has a lot of other items as well. Bracelets, Watches and Earrings! Price: My necklace is $35, her watches are just $20. She has very reasonable prices. I will be buying from her in the future! Overall: ***** Definitely. I have nothing to complain about with her beautiful and one of a kind jewelry! Wow - lots of beautiful choices! I really like the Drops Of Lavendar Pendant Necklace. i would get the "sweetheart's bracelet"! I would like the Kaleidoscope Necklace. I love the Caribbean Blue and Dragonflies Pendant Necklace! I follow on gfc entry #1. I follow on gfc entry #2. I follow on gfc entry #3. I would get the tuscany beaded watch! I am your facebook friend! Modern, Hip and Trendy Lariat Necklace! I'd like to get the Sunflowers and Sun Tea- Charm Bracelet. Very beautiful. I'd get the Rose Is Just A Rose Petite Watch! I luv, luv, luv the Lucid Charms Recycled Glass Bead bracelet...bright, colorful, I want it. I love the Petrified Heart Pendant. What a neat idea--jewelry from petrified wood. I still have some petrified wood I found when I was a very young child in California. I love the Daylight Moon Pendant Necklace. I like the kaleidascope pendant. i want the tuscany beaded watch! 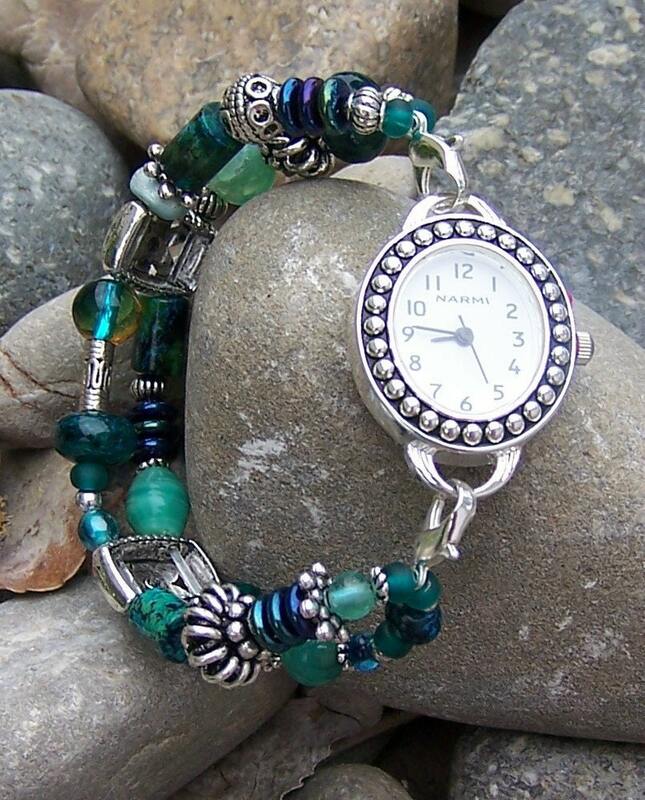 I love the recycled glass beads bracelet! I'd probably get the Unique Peruvian Chalcedony Marquise Necklace - gorgeous! I'd get the Black Tie Affari watch! Christina - xristya@rock.com - I'd get the Daylight Moon Pendant necklace - very elegant! I would love to get the Ivory Coast - Recycled Glass Beaded Necklace! I love the Daylight Moon Pendant Necklace, thanks! I would get Lapis Lazuli Earrings . they are beautiful. I would get the confetti bracelet I think... so many great items. I would get the Oriental Garden Bracelet!